WHATS HAPPEND IN URUGUAY. THE MOST BIG ROBBERY TO THE BANK OF MONTEVIDEO TO THE SAVE MONEY PEOPLE AND THE GOVERNEMENT MAKE NOTHING??????? 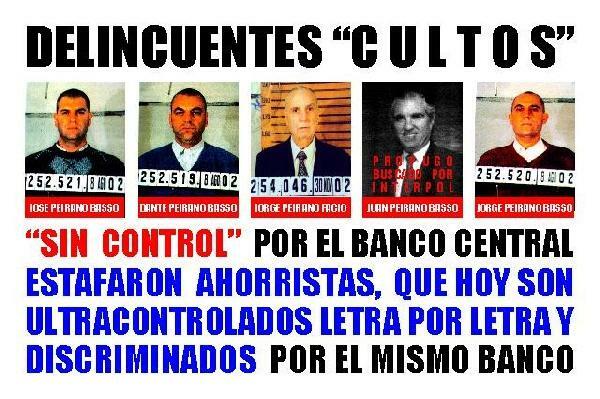 WHAT DO THE CENTRAL BANK IN URUGUAY TO STOP THIS??? ITI IS CORRECT THAT THE POLITICAL PERSONS THERE IN THE GOVERNEMENT OF JORGE BATLLE WAS DOING THE BEST JOB OR ARE GUILTY IN THE CHARGE OF FRAUD. WHATS HAPPEND IN URUGUAY???? ?N WHEN WE TALK ABOUT FRAUD THE HUNDREDS AND HUNDREDS OF PERSONS THAT TRUST IN A OFFICIAL BANK AND LATER THEY WERE BURGEL WHAT THEY THINK ABOUT. WHAT DO THE CENTRAL BANK TO STOP THIS ROBBERY??? THE PEIRANO FAMILY IN URUGUAY THAT THEY HANDEL THE BANK OF MONTEVIDEO, WHAT DO THEY WITH THE MONEY OF THOUSAND OF SAVE MONEY PEOPLE????? THEY STEAL ALL THE MONEY. THEY STEAL IN ALL THE AREA OF SOUTH AMERICA 800 MILLON DOLLARS. THIS FAMILY THAT BELONGS TO THE OPUS DEI FAMILY STEAL THE MONEY OF ALL THE SAVE MONEY PEOPLE THAT TRUST IN THE BANK OF MONTEVIDEO IN URUGUAY.